TORONTO - The Toronto Blue Jays took game 1 of a 3 game weekend series vs the Los Angeles Dodgers. Marcus Stroman pitched 7 strong innings giving up 2 earned runs. The win went to Drew Storey as he came on in relief with the game tied in the 8th. 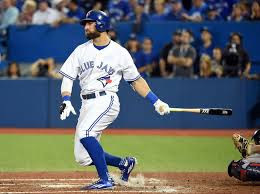 The Jays enjoyed a 2 run home-run from Jose Bautista and 3 run shot off Kevin Pillar's bat to move their season tally to 1 game over .500 to 16-15. R.A Dickey matches up against Clayton Kersaw in game 2 of 3 at the Rogers Center on Saturday.